Brunton BN375 Echo Pocket Scope Multi Coated 3.25"
Get a perfect view of remote objects with the Brunton Echo 7x18 monocular, which has a 7x magnification. The BaK-4 prism glass of this Brunton monocular provides crystal clear images. This pocket scope’s multi-coated lens produces bright images as it allows increased light transmission. 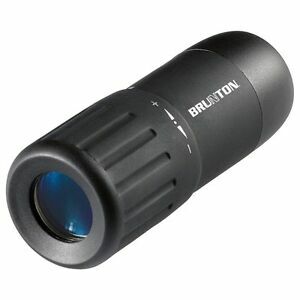 The Brunton Echo 7x18 monocular is made of polymer frame which makes it sturdy and suitable for rough use. Exit pupil being somewhere between 2.6mm - 1.8mm, you can have a clear and visible view with this Brunton monocular even in low light conditions. Having an objective diameter of 22mm, this pocket scope collects light producing sharp images. The Brunton Echo 7x18 monocular weighs only 1.8 ounces, making it portable and handy for outdoor sports. Great optics in a small package. How different can one monocular be from other monoculars? There can be a big difference, and this monocular is a big improvement. This unit is just a shade over 3 inches long, the optics are great, and the focus adjustment is smooth. I really didn't believe the claim that this unit can focus down to the 11 to 12 inch range, but it does!! Other 7X and 10X monoculars are on the market for about $10 (I have a couple of each). They are adequate most of the time, but for superior optics and performance in a compact unit, the Brunton monocular can't be beat if you can get it for about $20 or less. I highly recommend this unit. Small, lightweight and pretty good optics. This is a great monocular that you can carry anywhere without knowing you have it on your person. Fits in a bag or EDC system very nicely given its ultra-light weight & compact size. Good optics for the price and the magnification is just right for something so small--more power and you would have shake issues. Won't replace a pair of good binos, but at least you will have it with you! You're able to view objects with decent clarity and detail. very high quality and lightweight. its perfect for any bag you have even for camping, hiking ore survival bag.